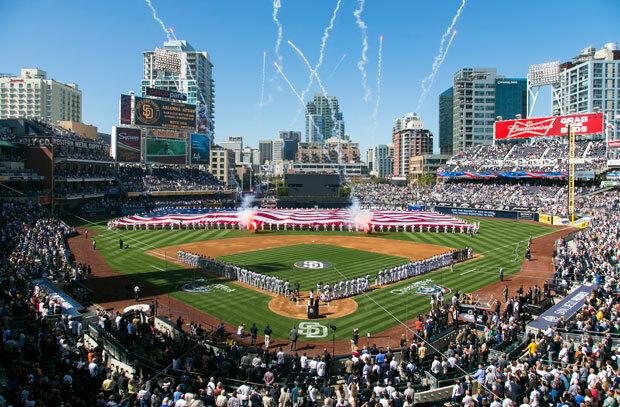 PETCO Park is situated in downtown near San Diego’s Gaslamp District, the main entrance located just two blocks from the downtown terminal of the San Diego Trolley light-rail system. With new amenities and a revitalization of the downtown neighborhood, fan interest renewed. Modeled after recent successes in downtown ballpark building (such as San Francisco’s AT&T Park), and incorporating San Diego history in the form of the preservation of the facade of the historic Western Metals Company building (now the left-field corner, the corner of the building substituting for the left field foul pole), the new Petco Park is a sharp contrast to their previous home at Qualcomm (Jack Murphy) Stadium which was a cookie-cutter type football-baseball facility located in an outer, mostly commercial-industrial, area of the city near an interstate interchange.